Today I’m sharing my thoughts regarding my favorite character from Tehereh Mafi’s Shatter Me series, Warner. Warner is a multifaceted character with many-many sides to him and through each book more and more of him is revealed. When I started reading Shatter Me, I wanted to hate Warner and I tried, but there was just something about him that kept me guessing and wanting more of him. I was intrigued by him and just knew there had to be more to this guy. By the end of Destroy Me I couldn’t resist Warner anymore. I was truly fascinated and by the end of Unravel Me I was way past captivated and sinking deep into the depths of obsession. In Shatter Me, everyone loves to hate Warner. People are fearful of him and do not see any good in him. He comes across as callous, harsh, uncaring, selfish, power-hungry, not to mention cruel. Warner shoots Private Seamus Fletcher, 45B-76423 on the quadrant in front of Juliette and his soldiers. He forces Juliette to touch, thereby hurting, Jenkins in front of the other soldiers. He wants to use Juliette as a weapon. He is threatens to hurt Adam in order to get Juliette to comply with his rules. He makes Juliette think she is going to kill a child again. He truly seems possessive of Juliette. After Adam and Juliette escape, he tries to kill Adam and Kinji. He is responsible for all of these things and shows no remorse. He does, in fact, seem quite the embodiment of evil and even a bit sociopathic. Nevertheless, I am curious about him. What makes him tick? Why is he doing this? When Juliette seduces him in order to shoot him, why do I want them to keep kissing? Why am I shipping them? There has to be more to his story! I want more of Warner, so I read Destroy Me, and I find out that there is, in fact, more to him! We find out for instance that when Warner killed Private Seamus Fletcher, he did so because Private Fletcher beat his own wife and his own children daily. Private Fletcher even kept food from them, slowly starving them to death. By killing this man, Warner was trying to protect Fletcher’s family. Fletcher was the monster, not Warner. The Fletcher incident also served as a cover to make dear ole Daddy, who is none other than the supreme commander, think he is killing insubordinate soldiers who are partial to the resistance. By doing this, is he is trying to save innocent lives. However, when the supreme commander finds out Warner did not kill Fletcher’s family he orders them killed and we see the true expectations held by the Reestablishment for Warner. Warner is not sold on the Reestablishment either. In the same way Warner tries to protect innocent people, he was protecting Juliette from the thousands of lonely soldiers in sector 45 with the incident regarding Jenkins. If it weren’t for this, soldiers would have undoubtedly harassed Juliette and tried to get their hands on her. Without this necessary and controlled illustration with Jenkins, Juliette might have killed any one of those men and what would it have done to her? Warner didn’t want her to be harassed by them and he didn’t want her to have to deal with the guilt she would experience after killing one of his soldiers because of her touch. Warner was protecting Juliette! We follow Warner into Sector 45 and we find out he visits the compounds frequently to check on the citizens because he wants to make sure they are cared for, have enough food and have enough medical care. He is concerned for the people. He looks the other way when his men take extra food home to their families. Then there is the scene when he feeds and cares for the stray dog and I have major Warner feels! When Warner’s father shows up we find out the reasons why Warner is self-loathing, broken, empty and lonely. He has suffered abuse all his life at the hands of his father and this is all he knows. Meanwhile, Warner reads Juliette’s notebook and it becomes apparent that he truly loves her and he never, ever wanted to hurt her. He simply didn’t know how to show love appropriately because he had not experienced it himself and simply went about it in the wrong way. He realizes he has misunderstood Juliette and her happiness was not because of him, but was because of Adam. At this he becomes even more distraught. At the same time, when he reads her notebook he sees into Juliette’s soul and realizes just how much they are truly alike; he understands her completely in a way that nobody else could, not even Adam, and it changes him! We see him begin to realize who he really is underneath the hard shell of his exterior, which has been constructed to protect him over the years. Then along comes Unravel Me and Warner’s shell cracks wide open. He is captured and held hostage by Castle and during Juliette’s interrogations, he opens up to her and she starts to see the person inside the shell. He makes her feel “safe and familiar.” He knows everything about her including how she has killed. He accepts her. He encourages her to accept herself and find a way to deal with it. He doesn’t want her to feel ashamed of herself. He sees Juliette as strong and capable. The more they spend time together; we see that he and Juliette are attracted to each other on an intellectual level and emotional level. And even before the illustrious chapter 62 with their white hot passion, Juliette realizes she is attracted to him physically. Then Warner recites the words he has memorized from her journal to her, explains why he did the things he did and apologizes. And in those moments Juliette understands him and she sees into his soul, which is wide open. We find out about Warner’s gift and that he can touch Juliette because he can redirect others abilities. He can do this because this very ability is based on empathy, which allows him to intellectually identify with the feelings, thoughts, and attitudes of others. Yes, he has used this to his advantage in order to be manipulative. However, he also understands others. I am reminded of a quote from another book, very different from this one, but it has to do with empathy and war and when I think of this quote I think of Warner and I understand him. In the end, we see just how truly horrific Warner’s father is when he shoots Juliette in cold blood, just to punish his son. But, it provides us an opportunity to see Warner with all his defenses down. In the horrible moments when Juliette lay dying on the floor with Warner over her, begging Sarah and Sonya to save her, his shell is completely gone and all that remains is his warm, loving heart beating right out of his chest for Juliette. This is a pivotal moment for Juliette and it’s at this moment when I realize that although I personally love Warner, I realize that because of all that’s happened and their true persons have emerged, Juliette and Warner need to be together. 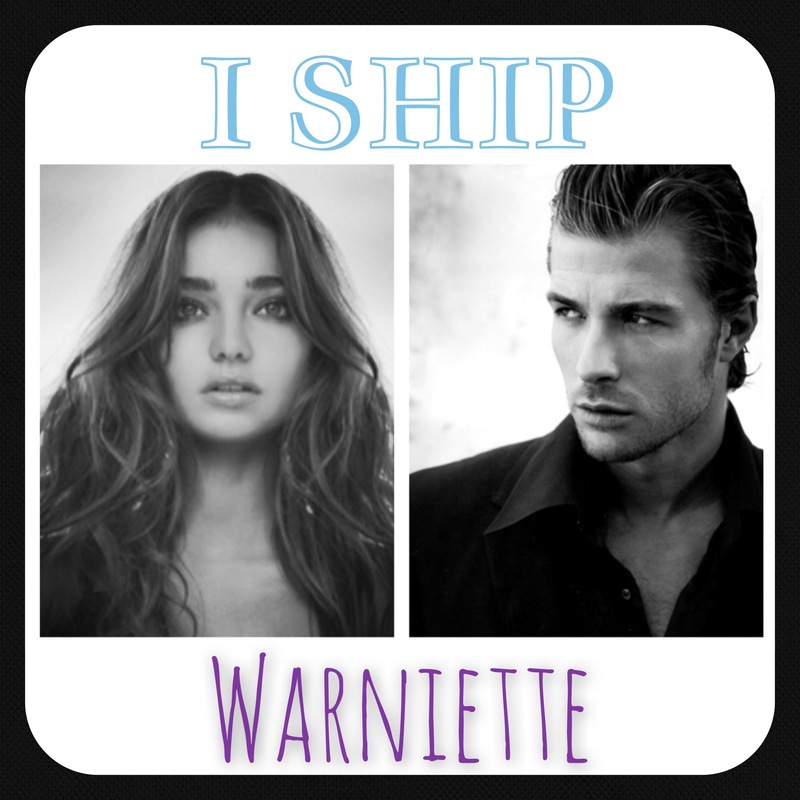 Juliette and Warner are perfect for each other. They understand each other better than anyone else ever could and on top of it all nature has given them abilities that bring them together-bring them together to be an effective team against the reestablishment. Then, Juliette says, “I’m done being nice. I’m done being nervous. I’m not afraid of anything anymore. Mass chaos is in my future and I’m leaving my gloves behind” and this solidifies my feelings about Warner and Juliette.